Well, is not really a battle, as each one has their place and time and at Stephanie's and Rene's big day I had to use both. 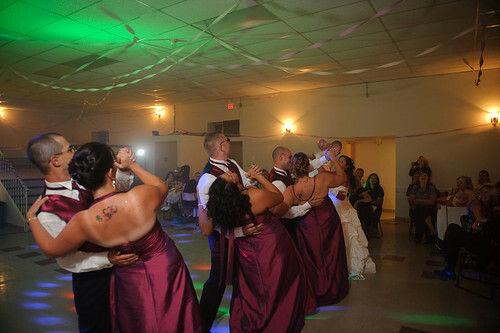 The first and only time that I had to bring the ABs out was for the family and bridal party pictures. This particular situation required quite a bit of power because the couple wanted their images taken under a gazebo on a very bright day (can you say severely back lit?). The following image was taken with a simple setup of one (1) AB1600 on a medium foldable ocatbox at camera right at 1/2 power triggered via PWs and one (1) AB800 on a 22" beauty dish at camera left at 1/2 power triggered via PWs. By contrast, I just required one (1) SB-900 off camera on a Lumiquest Softbox III set to TTL -0.7 EV and one (1) SB-800 set to TTL 0.0EV positioned across the room (you can see it in the picture). All triggered via Nikon's CLS.